The 88-2SIOJP is an enhanced, drop-in replacement for the original MITS 88-2SIO serial interface board. The 88-2SIOJP also provides several key features found in the MITS Turnkey board, including jump start and EPROM with RAM overlay. The serial ports are designed around the Motorola 68B50 ACIA. The data rate for each serial port is set by a DIP switch, allowing communication from 110 baud through 76.8K baud. For comparison, the original 88-2SIO has a maximum baud rate of 9600 baud and requires wire jumpers to change baud rates. Either serial port can be set up for RS-232 (with optional hardware handshaking), Teletype (20 mA current loop), or TTL communication. These settings are easily configured with push-on jumpers instead of the confusing maze of wiring options on the original 88-2SIO. 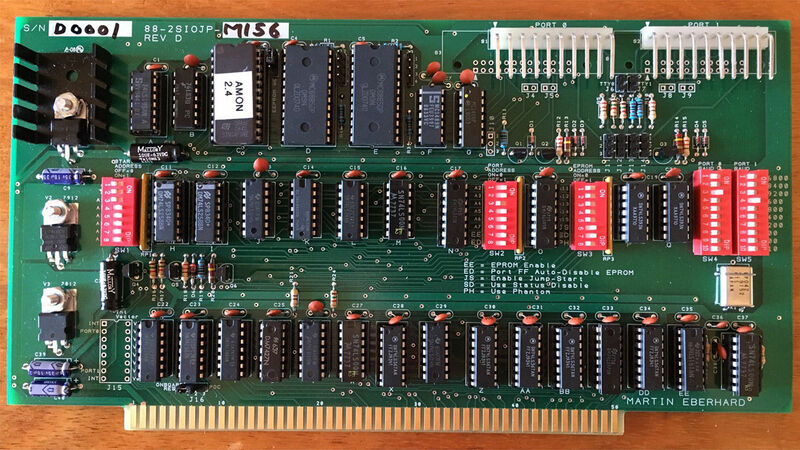 Two options are available for connecting the 88-2SIOJP serial port to DB-25 connectors on the rear panel: 1) The same 10-pin Molex 0.156” connector used on the original 88-2SIO, or 2) A 26 pin header that allows use of an off-the-shelf DB-25 ribbon cable assembly. The EPROM socket supports both 2716 EPROMs and 2816A EEPROMs (2K x 8). The starting address for the EPROM is set with a DIP switch. You can also use a 2732 EPROM, though only the upper half is accessible. EPROM access requires zero wait states. If a 2816A EEPROM is installed, then writing to the EEPROM may be enabled or disabled with a jumper. The EPROM can be completely disabled with a DIP switch. When the Automatic EPROM Disable feature is enabled, the EPROM is available to the CPU after reset and until the first IN instruction from port 0FFh (which is the Altair front panel’s switch register). Once the CPU inputs from this port, the EPROM is no longer available, and overlaid RAM at the same address becomes available to the CPU. This feature is equivalent to the automatic EPROM disable feature in later versions of the MITS 8800b Turnkey board which allowed Altair BASIC to run in a full 64K of RAM. 1) The 88-2SIOJP disables the status signals generated by the Altair CPU board, and generates replacement status signals with MEMR held low, so that other memory boards do not respond. This method works with almost all memory boards, including all memory boards made by MITS. 2) The 88-2SIO generates the Phantom signal on the bus, which will disable Phantom compatible S-100 memory boards, though not any MITS memory boards. The Power-On Clear circuit on the Altair 8800 and 8800a CPU board does not reset the 8080 processor, requiring you to toggle the Reset switch on the front panel of these machines after power-on. MITS fixed this problem in the Altair 8800b by asserting Reset, synchronized with the system clock, during power on. The 88-2SIOJP includes a Power-On Clear circuit that is similar to the Altair 8800b’s Power-On Clear circuit. You can optionally connect this circuit to the S-100 Reset signal for correct power-on reset operation. AMON provides commands for manipulating memory, serial file transfer with a PC for loading and saving files into and out of memory (in Altair Absolute Binary format or Intel Hex format), as well as booting from any Altair boot device (paper tape, cassette tape, 8” floppy disks, minidisks, or from an Altair Datakeeper hard disk). AMON can also be used to program EPROMs when using a memory-based EPROM programmer such as any of the Cromemco Bytesavers. The 88-2SIOJP is designed and sold by Martin Eberhard. The cost is $125 plus shipping. To purchase, contact Martin by email at mfeberhard followed by ASCII 0x40 followed by the Google email domain name. The 88-2SIOJP comes fully assembled and tested in either the M156 or the R100 configuration as pictured below. The AMON monitor on a 2716 EPROM is also included. Populated with the same white Molex connectors used on the original 88-2SIO for connecting to DB-25's in the rear panel. 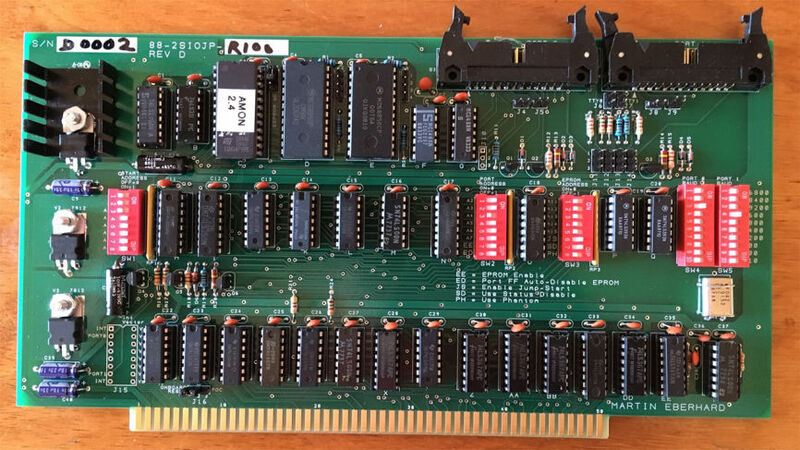 Populated with standard 26 pin headers that allow use of an off-the-shelf DB-25 ribbon cable to connect the 88-2SIOJP to the rear panel DB-25 connectors.